Our Lady of the Annunciation chapel at Hal Millieri. Din l-Art Helwa is opening the Hal Millieri mediaeval chapel dedicated to the Our Lady of the Annunciation on Sunday mornings this month, dedicated to the Annunciation, as from this Sunday. Treasures at the chapel, which had been restored by DLH, include a rare cycle of 14 wall frescoes of the Byzantine cult. 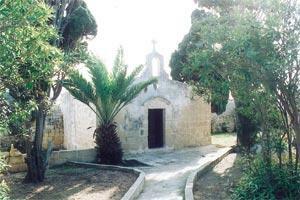 DLH said the Annunciation chapel was the most important historical monument from Malta's mediaeval past. Built around 1450 and partly cut out of rock, it was constructed over the site of an earlier chapel and parts of a late Roman rural complex of which some large stones can still be seen in nearby country lanes. In fact, its name, Millieri, is said to be derived from the word Milliar, which is a Roman mile. It gave its name to a village that disappeared by 1750. The chapel was given in trust to DLH in 1968. The chapel will be open from 9 a.m. to noon but on March 28, feast of the Annunciation, it will remain open from 9 a.m. to 6 p.m. Holy Mass will be celebrated at 10 a.m. followed by the blessing of the churchyard. Guided tours by custodian Anthony Mangion and historian Stanley Farrugia Randon will be held on that Sunday at 11 a.m. and 3 p.m. Admission to the chapel and participation in the guided tours will be 50c with the exception for attendance at Holy Mass. Donations will be received. DLH said the money would assist it to begin restoration on the adjoining 17th century chapel of St John the Evangelist close to the Annunciation chapel. The Hal Millieri chapel is best reached via Zurrieq through Mqabba Road by taking the first right-hand side road on leaving the fountain roundabout at the entrance to Zurrieq. For further information call DLH on 2122 0358.